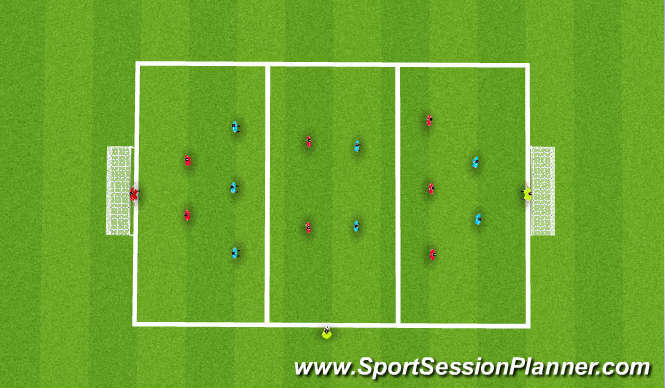 1v1 in 10x15 grids, blue passes across to red then closes ball down. red attempts to beat blue and stop ball on his line to score. players return to start position and red passes to blue etc. 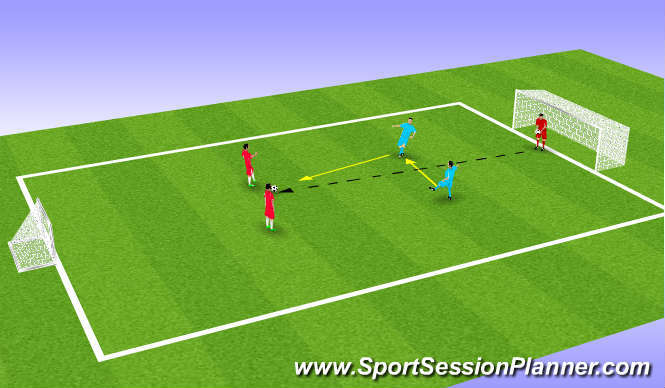 2 v 2 GK throws ball to red team who try to score in big goal - blue team defend try to win ball back then score in small goal. progression - 3v2 + 1 recovering defence / midfield. coach plays ball into middle 1/3 to reds they play 3 v 2 try to play one of the forwards in end zone they play 3 v 2 one of blue midfield makes recovery run to make 3 v 3. 1 v 1 close ball down quickly - low stance side on, be patient - jockey show onto weaker foot. 2 v 2 - 1st man close ball down. 2nd man position to see 2 nd attacker also cover 1st defender. 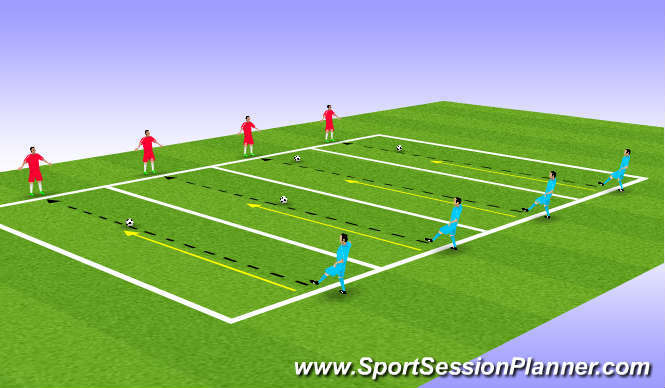 1 v 1 show on to weaker foot - away from goal. &apos;in baalance&apos; pressure ball as team. &apos;out of balance&apos; drops off / wait for support. high intensity - allow players to walk back to start positions. concentration - don&apos;t ball watch. see man - see ball. communication - pass on runners try not to cross over. Everybody did well defending 1 v 1. listened to objectives and responded well. however players found it more difficult 2 v 2 defending , few players struggled with positioning as second defender N.B. Josh Crews, Joe Ridley.